Sometimes I wonder if Michael Mann is onto something that has eluded other directors of his generation. Take Public Enemies, out on DVD and Blu-ray tomorrow. As I've said before, there is an immediacy that its digital cinematography brings for the first time to the venerated gangster genre. The film's naysayers gripe about the motion blur and countless other issues they cannot get past when watching the film in theaters this past summer. But a quick pop of the new Blu-ray into my home theater system confirms what I've been saying all along. This movie grows immeasurably when watched digitally, something that many couldn't do depending on the movie theater where they caught it playing. I was first on to this phenomenon after I experienced a vastly different reaction watching Collateral (2004) at home from the reaction I had seeing it theatrically. A similar experience occurred when I first saw Mann's followup, Miami Vice (2006) at home. It makes me want to throttle theater owners until they make all of their screens digital-ready, an admitted near-impossibility economically (as even the threat of their inability to run Lucas' Star Wars: Revenge of the Sith or Cameron's Avatar has had no effect) for many of them. 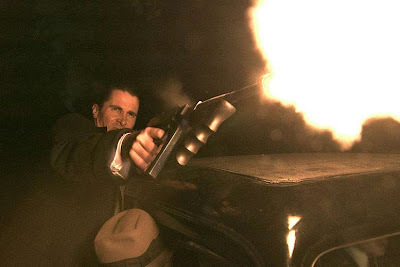 Seeing the Public Enemies Blu-ray on even just an okay home theater system like mine really puts you there in the midst of Mann's voyeuristic look at the conflict between gangster John Dillinger (Johnny Depp) and G-man Melvin Purvis (Christian Bale). Mann's explorations into the codes of masculinity, so representative of his entire body of work, has become increasingly transcendent over the course of his last three films. Whereas Collateral was initially criticized for being too on the nose in its depiction of the ying and the yang symbolized by Tom Cruise and Jamie Foxx's two main characters, Miami Vice was attacked by folks who thought it wasn't expressing these themes explicitly enough. Those that were ignorant of the tone poetry that characterized Miami Vice launched into similar attacks on the sleek, stripped down abstractions of these themes as presented in Public Enemies. They fail to recognize Mann's aspirations to achieve a sense of verisimilitude through his digital photography, minimalist dialogue, and heightened preoccupation with the rest of the viewer's sensory perceptions focusing on sound and visual design (especially in the climactic shootout involving Pretty Boy Floyd) rather than dialogue to illustrate his concerns. Mann's own commentary is particularly enlightening into his process for getting to the heart of a story, which seems to involve research, direct interviews with any survivors of the period, more research, and then a sort of zen letting go of all of his findings to focus on the film on an intuitive level. An interactive picture-in-picture historical timeline that one can watch while seeing the film is also rewarding as far as filling in the blanks for those who aren't completely satisfied by the historical accuracy of the film. Is this the future of cinema; a future in which one really doesn't get the entire picture until one views the film in multiple platforms? I certainly hope not, since I believe the text of a film is ultimately more important than its subtext (even though this can yield its own rewards). Public Enemies certainly struck me as one of the best films of the year when I saw it theatrically. But what Mann seems to be on to is that films are becoming interactive to a previously unimaginable degree. The Blu-ray for Public Enemies makes me wonder if he is now approaching his work with some of that aforethought. A thought-provoking review. His use of the digital camera and of natural light do add immediacy - there is one less veneer of artificiality between us and the world of the film. At least that's the case in his films. Yeah, I loved this film also and it was one of my faves of the year but it seems that the main complaint people had against it was that none of the characters felt fully-realized, at least not enough for you to care about them, esp. Dillinger's crew. This really didn't bother me so much and the film is really about Dillinger and his relationship with Billie, which I felt was developed quite well. I think that it is a film that will be appreciated as the years go on. Already, you starting to see MIAMI VICE get a more favorable response from film buffs.